Meet in Fiennes car park by 10AM, coffee, cake and welcome 10-10.30 when the guided tour will begin. Leave Fiennes around Midday for an hour or so run through the Cotswolds to a pub lunch. For those that want to join in, there will be a second run to Burford Garden Centre for tea. I would like to know final numbers and menu choices by our next group meeting on 17th April. The invitation is offered to all Register members, not just Ridgeway. As discussed at our inaugural meeting I have approached Fiennes restoration to see if I could take up the postponed invitation to visit their workshops and am delighted that we have a special invitation for our group and the Register to visit as part of a drive it day run, which I would like to extend to other Register members. I worked with Fiennes 2 years ago and had a tour of the workshops with the MD and was hugely impressed with the quality of work and variety of cars they had there. Fiennes have extensive workshop facilities, specialising in Rolls Royce and Bently restoration (they now machine more cylinder heads for Rolls than Rolls do! ), but also many other exotic and rare cars, vintage and classic, many of which end up for sale at the Cotswold Motor Hub. They have offered to tailor a visit to our specification and suggest allowing around 1½ hours for the tour (several workshops, body forming, trim, machine shop etc) and they have also offered us refreshments while we are there. We can go any time between 10 and 4 and have first choice of the time. The Cotswold woollen mill, museum and shop is a short walk away, as is the local gourmet pub, the Five Alls, who have offered a private fixed menu, £30.00 for 2 course and £35.00 for 3, although there are many other fine places to eat around Filkins and Burford is only 6 miles away. If we wish to do this I need to confirm soon so need feedback and numbers as soon as possible to say if this is what you would like to do as a group for DiD, and if so, in what order, Fiennes, lunch, run or run, lunch Fiennes etc. I would also be very happy for offers of help to arrange the run! …." 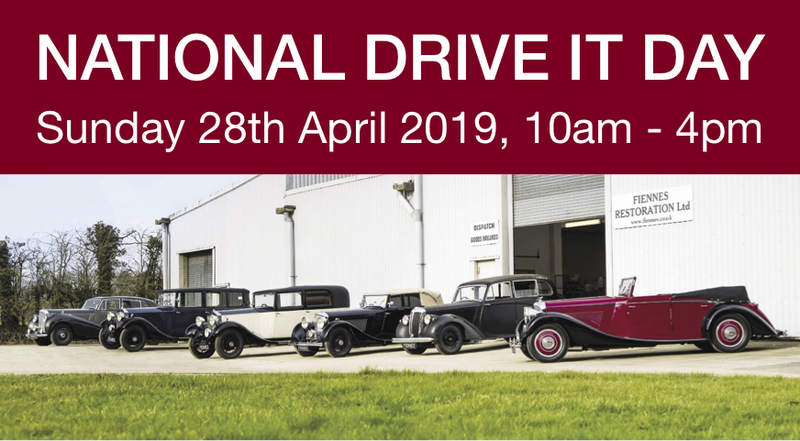 we would like to invite the TR Register to join us in celebrating National Drive It Day on Sunday 28th April at Fiennes Restoration; offering a tour of our extensive workshops, refreshments and, with space for over 200 cars, a good meeting point to celebrate the occasion….."
We are on the west side of the A361 two miles to the north of Lechlade on the road to Burford, which is six miles further north. You can Google it by the post code. However be aware that both Google and SatNav will point you to the east side of the A361. Please observe the road markings on the A361 outside our site as turning can be awkward.